missing last skull cant find yet where to use hammer..
Sarah there's a sneaky spot right above the arch in the right cactus/steps scene - use hammer there. The skins in the third set are well hidden. You're looking for dark brown on medium brown. Nice game, but lots of back and forth in this one. Be warned before going in - this one is long! Many sneaky spots - mouse over EVERYTHING several times - Good Ending! 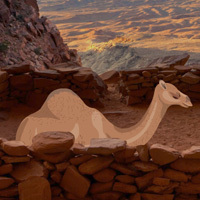 Happy Camel.